Twinsburg, OH. 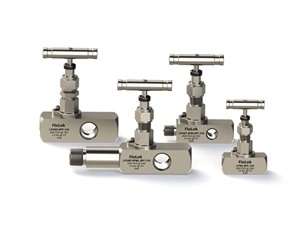 LP Series Rising Plug valves use a unique set of features that can improve reliability and reduce the operating costs for process instrumentation applications with working pressures up to 6000 psig (413 bar) and temperatures from -65 to 600° F (-53 to 315° C). Bonnet locks that prevent the accidental disassembly of the bonnet from the valve during maintenance, operation or from system vibration. Live loaded chevron packing compensates for packing wear and changes in temperature and pressure; this design maintains a leak-tight stem seal and reduces or even eliminates the need for packing adjustments. Non-rotating lower stems reduce packing, seat, and stem damage that can result from the stem tip rotating onto the valve seat. Back seating stem tips make inline packing adjustments safer. Straight flow path allow flow path to be rodded for cleaning. Sizes: 1/4, 1/2 in to 3/4 in. inlets and 1/4 and 1/4 in. outlets. Extended Inlets (Lagging): 2, 4 and 6 in. Specially Cleaning: Compliance with ASTM G93 Level C and CGA G-4.1, Cleaning Methods and Cleanliness Levels for Material and Equipment Used in Oxygen-Enriched Environments. To specify, add -XP98 to the part number. Sour Gas: SSP offers four configurations to meet the requirements in ANSI/NACE MR0175/ISO 15156- 3 and NACE MR0103/ISO 19745.